WBA vs Forest: West Brom will be hoping to build on their win at the weekend and close the gap to the automatic promotion places when they host Forest at the Hawthorns. The Albion came away with a 1-0 win over Stoke at the weekend. Dwight Gayle scored the winner, his 16th goal of the season as the Baggies registered a third clean sheet in five games. The result left them fourth in the table, five points off the automatic promotion places, with a game in hand. Darren Moore’s side have only won three of their last eight games in all competitions, which is a run they desperately need to improve. Despite that run, they still have a major shot at automatic promotion. They are without a win in their last three home games, which needs to be addressed if they are to return to the Premier League at the first time of asking. Forest’s promotion push was given a timely boost at the weekend with a 2-1 win over Brentford. The result was Martin O’Neill’s second win in four games. It leaves them ninth in the table, five points behind sixth-placed Bristol City, having played a game extra. Lewis Grabban was recalled to the against the Bees and netted his 16th of the campaign. The 31-year-old needs to play a crucial role between now and the end of the season if they’re to break into the play-offs. On the road, Forest have lost their four and haven’t tasted victory in seven matches. Lee Mason is the referee for this fixture. The Englishman has officiated 2 second-tier matches this season, having spent most of his season in the Premier League. In that time, he has accumulated an average booking points total of 10. Therefore, I would advise a maximum of 30+ total points for this fixture. West Brom side will be buoyed a win and a clean sheet at the weekend but need to address their home form. Forest are sick travellers and therefore I think that will see the hosts through. 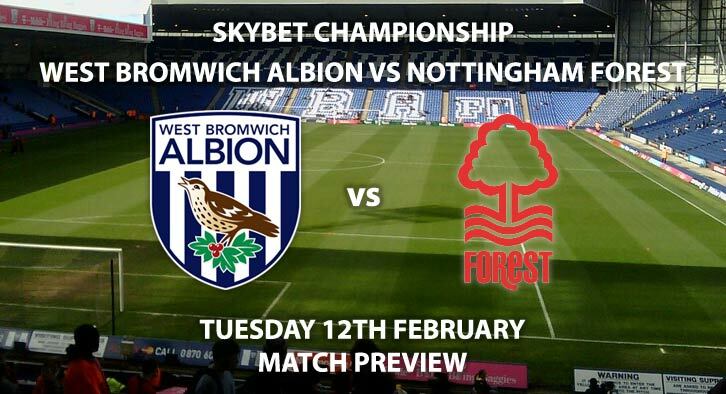 West Bromwich Albion vs Nottingham Forest will be televised live in the UK on Sky Sports Main Event with kick off at 20:00 GMT. Correct Score – West Bromwich Albion win 3-1 – (link no longer available). To Score and Win – Jay Rodriguez – 11/4. Price Boost – Joe Lolley to score from outside the penalty area – 22/1. Odds and markets last updated on Wednesday 12th February 2018 @19:27 GMT. Keep checking back to see if there’s any updates to markets – the time stamp in the previous sentence for when we update tips on this page will be updated.